Introducing three short stories & three novellas: While on vacation, a young man's fiance becomes a heart-collecting Yuletide Thing on Christmas Eve. Get stuck in traffic when The Freeway Reaper claims another soul. A suburban family is plagued by a horde of were-rats. Special Agent Sam Cross, mortally wounded by a Jamaican specter, journeys into a psychedelic Festival of Fallen Souls in search of a supernatural healer whose lover's touch brings in contrast instant death. A legendary flesh eater arrives on the shores of an ancient Minoan city, infecting its population, beginning with a teenage boy's father who's summoned by the pompous king to become an undead garbage disposal. In Red Afterworld, an ex juvenile preacher gets his childhood wish of becoming a vampire when he's recruited into a male-only biker fraternity and finds himself one of the few survivors of global nuclear war, discovers a time portal in the Arizona desert with the hope of saving the world, and finds true love. 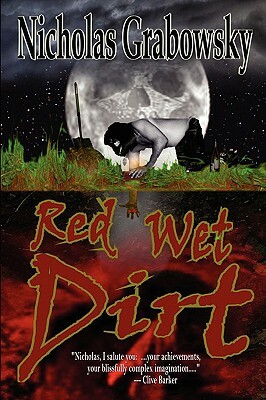 Including extra minor works from the author's youth and the short screenplay Cutting Edges, the basis for an upcoming film and the author's directorial debut, Red Wet Dirt is to die for and is destined to become a classic way beyond its genre.